Need an interactive way for students to review the Periodic Table? 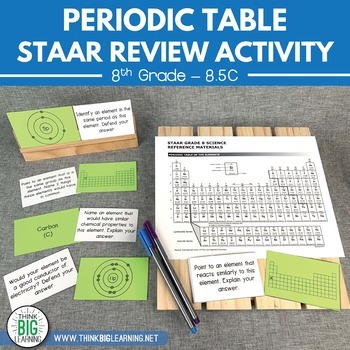 This activity allows students to think and talk through multiple questions using various elements to better understand the arrangement of the Periodic Table. 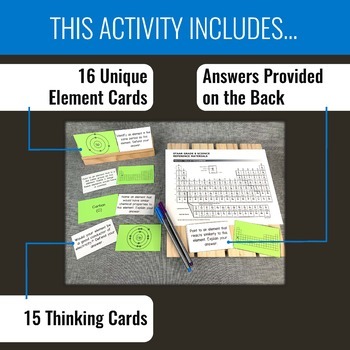 These thinking cards push students to consider groups, periods, metals/nonmetals/metalloids, chemical properties, etc. and engage in conversation about the content. 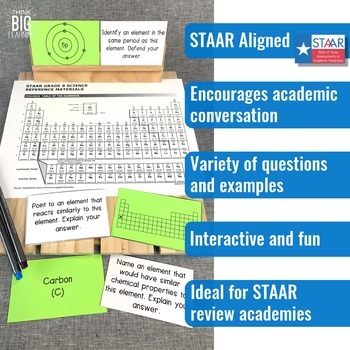 This is a quick, easy review of TEKS 8.5B, that gives students ownership of the content necessary to be successful on STAAR. 8.5B - TSIET interpret the arrangement of the Periodic Table, including groups and periods, to explain how properties are used to classify elements.